The challenges that climate change presents humanity require an unprecedented ability to predict the responses of crops to environment and management. Geographic information systems (GIS) and crop simulation models are two powerful and highly complementary tools that are increasingly used for such predictive analyses. Most notably, the portions of the Fourth Assessment Report (FAR) of the Intergovernmental Panel on Climate Change (IPCC) (Easterling et al., 2007) that dealt with agriculture made extensive use of predictions from crop models and in many cases, the regional assessments that they summarized also involved GIS (e.g. Thornton et al., 2006). The inherently spatial aspects of climate and climate change make them readily amenable for incorporation into a GIS-based analysis system. It is becoming ever more apparent that climatic changes are occurring non-uniformly across regions or agro-ecosystems. GIS provides a useful tool to capture this spatial heterogeneity and provides powerful ways in which to visualize and communicate the actual or potential changes that are occurring. A GIS-based framework has been the fundamental element of several major assessments of the potential impact of climate change on agriculture (e.g. Tubiello et al., 2000; Fischer et al., 2002; Parry et al, 2004). a rapid and efficient manner is another important factor. 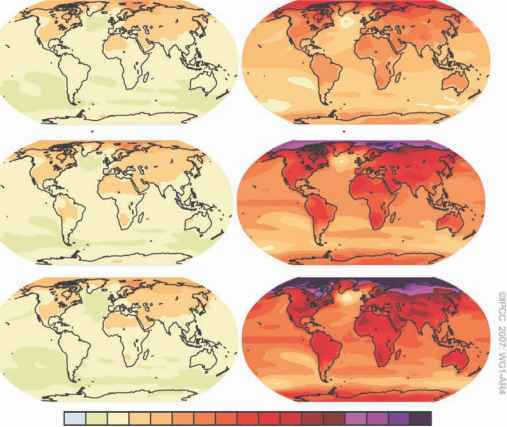 The suite of advanced global general circulation models (GCMs) that inform major assessments such as those of the IPCC (e.g. Solomon et al., 2007), and the accompanying emission scenarios developed for the IPCC assessments (IPCC, 2000) form the basis of many climate change assessments (e.g. Parry et al., 2004; Lobell et al., 2008). Increasingly, the outputs of the GCMs under differing emissions scenarios are available in data formats suitable for direct use in GIS-based systems (e.g. the WorldClim data set (2009) see http://www. worldclim.org/futdown.htm). The availability of multiple GCM outputs, coupled to GIS-based systems, has permitted increasing opportunities for analysis of spatial convergence or divergence of GCM outputs at global or regional scales (Neelin et al., 2006; Lobell et al., 2008). Crop models integrate available information on plant ecophysiology, soil chemistry, agroclimatology and related fields, and simulate key processes thought to determine crop performance in a given environment. For climate change assessments, yield responses for major crops are derived mainly from applications of crop growth simulation models coupled to global or regional climate change models and run under a range of emission scenarios. Coupling mainstream crop simulation models such as ceres and apsim to a suite of five to ten widely accepted advanced GCMs, for example the Hadley Centre's HadCM3 or CSIRO's MK3, and evaluation under the standard range of IPCC emission scenarios has been a common approach (e.g. Defra, 2004, 2005). Meta-analysis of several such global simulation studies as reported by the IPCC Third Assessment Report (TAR) (IPCC, 2001) and supported by the IPCC FAR (2007) is, not surprisingly, revealing differences between crops and regions, but several global trends are apparent. With global warming, many studies are now indicating an increasing polarization between the high-latitude developed countries and the low-latitude developing regions (e.g. Parry et al., 2004). Taking a major cereal crop like wheat as example, slight increases in yields at mid- to high latitudes are predicted if moderate mean temperature increases (1-3°C) occur. However, further warming, even in temperate regions, causes yields to decrease. In subtropical and tropical regions, wheat is often already near its limit of maximum temperature tolerance, so small temperature increases (1-2°C) reduce yield. Outputs from such simulation studies are providing useful information to inform future decision-making processes, although several uncertainties still remain, for example the extent and role of CO2 fertilization effects (Long et al., 2006; Tubiello et al., 2007). Crop simulation models and GIS are vital tools in predicting the impacts of climate change in agricultural systems. The two tools are complementary and the role of both technologies in predicting future situations centres around extrapolation. For GIS, extrapolation from the past based on correlation in a very loose sense plays an important role. For crop models, extrapolation based on how known processes respond to factors of interest (i.e. simulation) is a key factor, with the models often supported by GIS. This chapter reviews the use of these two tools for predicting impacts of climate change and examining options for adaptation. GIS and crop models can be integrated, providing predictions that combine the spatial perspective of GIS with the stronger representation of temporal processes of simulation models. Examples are given for major food crops and key agricultural zones, with a bias towards tropical and subtropical regions. Consideration is also given to factors limiting efficient application of the tools to climate change research. The focus is exclusively on climate change and increased CO2, but principles are similar for O3, N deposition and other factors, which are often included within global change.